Your family, your friends, and your future in-laws are all here. Seated together, they share stories that celebrate your life and your future. At the center of it all is love; at the center of it all is a table. A table is also the place where your memories will gather through all stages of your marriage and life together. 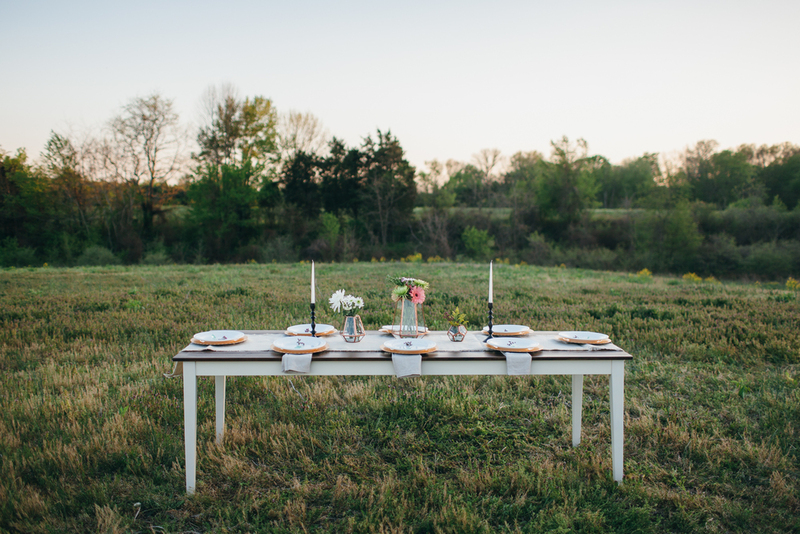 A wedding with Louisville Farm Tables is different. Instead of folding tables meant to be covered and ignored, these tables are a centerpiece for your conversation, laughter, and all of the memories for that special day. Made from solid wood, they are sturdy enough for all your guests' drinks and elbows. Hand-crafted locally with care, they ensure beauty and quality that makes a statement. Let Louisville Farm Tables compliment your special day. Louisville Farm Tables would be pleased to be a part of your event. Whether that be your wedding, family reunion, Derby party or work party, you and your guests deserve the best. Out tables comfortably seat 8-10 guests. To Learn more about pricing click the button below or fill out the form you see below to get a quote. Brides, this is your big day and we at Louisville Farm Tables want to help you make it even more special. Please remember to ask about our bride exclusive offers to make your wedding even more memorable.